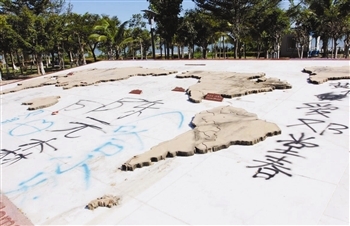 The Sanya government has called on tourists and residents to improve their behavior after a number of incidents and behaviours that have scarred the city’s property and stained its image. 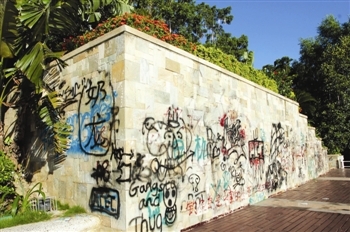 One of the most obvious examples of this problem can be found at the landscape avenue along the bank of Sanya River, where an entire marble wall was covered in spray paint with disgusting words. According to a local cleaning worker, such uncivilized behavior has caused a lot of work for them in recent times and has cost extra time and workers. Early this March, similar uncivilized behavior was reported at Dadonghai Scenic Spot, where tourists many tourists were found inscribing their names into the spot’s plants.